We take email for granted. It seems so easy. Just click the send button. But spam has made sending and receiving email a lot more complicated. This is especially true for people who like to run their own networks at home. If you are like me, you might have 1 or more physical machines running multiple virtual machines, not to mention multiple containers as well. All this network infrastructure needs to communicate with you somehow. After all, how do you keep tabs on whether or not your CRON jobs are successful? Email is the way. But sending email out from a home network without it being blocked at various points along the way can get complicated. We can go through the cost of buying a domain and email service, but who wants the cost? So how do we get the email through? This post explains how to configure Postfix to relay email through a Yahoo! account over SSL. The Yahoo! 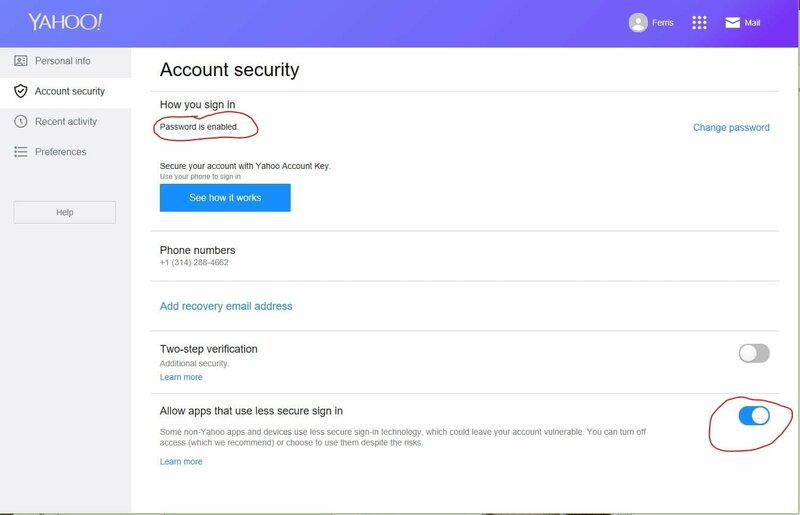 Account’s security setting must be set to allow password authentication. By default, it is not enabled. Go to the Yahoo! Account Security page and make sure “Password is enabled” is set as showing in Figure 1. Configure Postfix Authentication for Yahoo! Configure Postfix to login to Yahoo!’s SMTP server. This configures the server name, port, account id, and clear text password. Now edit the sasl_passwd_yahoo file using your favorite editor. Make it look like Listing 1, replacing ACCOUNT_NAME and CLEAR_TEXT_PASSWD appropriately. Configure Postfix Email Mapping for Yahoo! If user mike attempts to send an email from a server with the name bluegreensky, the default Postfix FROM address will be mike@bluegreensky. This is not good because if you try to relay this email through Yahoo!, it will be blocked since the FROM address does not match the Yahoo! account. To get around this, configure a regular expression mapping file that will change all local email addresses (like mike@bluegreensky) to the Yahoo! account email address. Next, create a yahoo map file that will change local email address to the Yahoo! account email address. Now edit the regex_map_yahoo file using your favorite editor. Make it look like Listing 2, replacing HOSTNAME – just HOSTNAME, not @HOSTNAME…don’t lose the @ character – and ACCOUNT_NAME appropriately. Configure Postfix SSL for Yahoo! If all goes well, Postfix restarted without any errors and is now configured to relay email from the server through the Yahoo! account. I typically test this with both mail and at. This post shows how to configure Postfix to relay email through a Yahoo! account over SSL. Sending email from a home network and have it not be blocked is tough. This configuration got me working. I hope it works for you.